Spring is a time of pasture renewal. However, after a winter of intermittent rain and continual refreezing, feeding grounds may be unsuitable for fresh growth. Ohio State University extension educators Rory Lewandowski and Stan Smith take a deeper look into potential strategies for rutted, damaged pastures in a recent Ohio Beef Cattle Letter. Pastures will renovate themselves if given the opportunity and left alone, with the only cost to producers being time, Lewandowski adds. This method will not need any additional help, aside from optional leveling with a harrow. He also notes that while the soil will typically already have the necessary seed bank to repopulate pastures, the makeup of regrowth and percentage of desirable plants is a gamble. “It’s likely in those paddocks where the sod base was torn up that summer annual species like pigweed, ragweed, barnyard grass, and goose grass will show up in heavy numbers in addition to the grasses and clovers that had been present in the sod base,” Lewandowski says. To combat this, Lewandowski recommends clipping summer annual weeds before they go to seed to ensure that grasses and clovers get adequate light. Producers should be able to lightly graze the pastures by mid- to late summer and, if pasture traffic is minimum the following winter, the sod base will continue to thicken. Given ample time, rotational grazing management, and additional land resources, producers can expect most pastures to heal by the following grazing season. If land constraints or waiting periods aren’t feasible, producers can turn to seeding for pasture renovation. When it comes to pasture productivity, seeding allows a new mix of forages to either enhance plant diversity or help pastures return to the original blend. Lewandowski recalls an NRCS State Grasslands Specialist asking graziers how old their pastures’ genetics were. The specialist explained that while row crop and livestock producers often take advantage of new genetics to boost yields or improve herds, pasture genetics are typically forgotten. Lewandowski explains that there have been advances in forages that allow for palatability, productivity, and grazing tolerance. 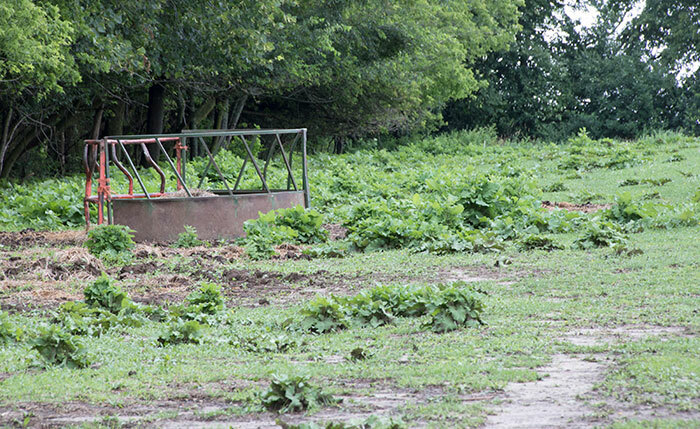 “A sacrifice paddock that has suffered from trampling and reduced stands may be an opportunity to bring some new and improved forage genetics into the pasture mix,” Lewandowski says. Lewandowski encourages producers to speak with their county extension agriculture educator or seed representative to determine the ideal pasture mix that fits each specific situation. That said, he notes that all producers should shoot for a grass stand with 30 percent legume distribution throughout, due to the cost of applying nitrogen to grass forages. This will ensure that supplemental nitrogen will not be needed. Sometimes delaying planting until late summer can actually work to the graziers’ benefit, he adds. Soil pH and fertility levels have time to improve before perennial seeding and competition from weeds and aggressive fescue sod bases are reduced. Lewandowski assures that pastures do not have to remain unproductive, as producers can plant a short-term crop for summer grazing that will also reduce weed pressure or kill back a fescue sod. Annual ryegrass could be a perfect fit in this situation because of its quick germination and growth. However, this needs to be managed with frequent and short grazing passes to prevent it from going to seed, he says. Lewandowski discusses an additional method in which producers seed a forage turnip in with a cereal grain like winter wheat or oats in April. Forage should be ready to graze in six weeks, allowing for several passes before the perennial grass/legume blend is seeded in August. Finally, Lewandowski mentions a third option in which sorghum-sudangrass hybrids or brown midrib varieties of sudangrass are seeded in late May. This tall, vigorous forage produces high tonnage and will be ready to graze before mid-July, he says.